Vain things are so tempting, but better the way of Christ and more rewarding. Very nice Scripture reminder of what is more important. Thanks for commenting, Pat. These were some of Samuel's words at the coronation of King Saul. Just like King Saul, just like Israel, we also find ourselves following vain things far too often; yet those are the things that can never bring us true joy. Thank you, Rebecca. We visited one of our local winter deer yards along Lake Superior recently, and I was able to snap a few hundred adorable photos! I'll share a few of them over the next several Sundays. There's still too much snow away from the shoreline for the deer to leave their winter yards, but we're looking forward to the day when we'll see them in our backyard again. It's been a long winter - and we're in the midst of a blizzard again today! Thanks so much, Joanne. I enjoyed your blog post today. Beautiful photo...and so true to remember not to go after vain items. Thank you for sharing. Thanks, Kristen. 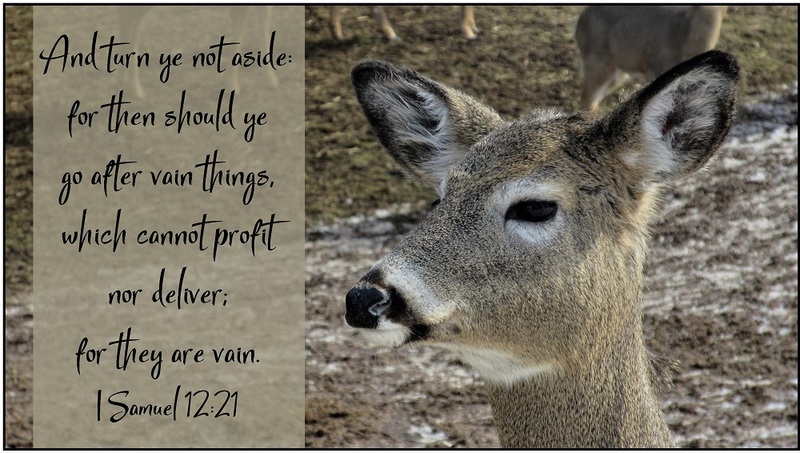 I like how the KJV puts it - "vain things, which cannot profit nor deliver." It's so easy to get distracted from the MAIN thing by vain things that are temporal and mean nothing. I am too often guilty of that. Distracted is a great word, Elizabeth. Please know that I'm praying for you and your family. So easy to get caught up in things we should not be paying much attention to. Your photo is beautiful. Interesting that these words were spoken to King Saul. I don’t want to be like him. A deer yard— i wondered if this was taken in your yard. You're right, Jennifer, Saul is not someone we should emulate. The snow is still way too deep away from the shoreline for the deer to move out of their winter yards - areas where they ride out our long, brutal winters. Looking forward to spring!